I don't have the best childhood memories of crispbreads. I always found them too dusty, too crumbly to eat, too dry. Now 20 years later, I kind of crave them once or twice a year. I walk past them in the supermarket and get this sudden urge to buy them. With summer approaching fast and the need to eat lighter foods, I had a craving a couple of weeks ago. Luckily, half the packet of crispbreads was still there when I came across this amazingly simple and tasty dip recipe a few days ago: Low fat yogurt with sun-dried tomatoes, fresh basil and a splash of olive oil was all it took. It hardly needs any extra seasoning. 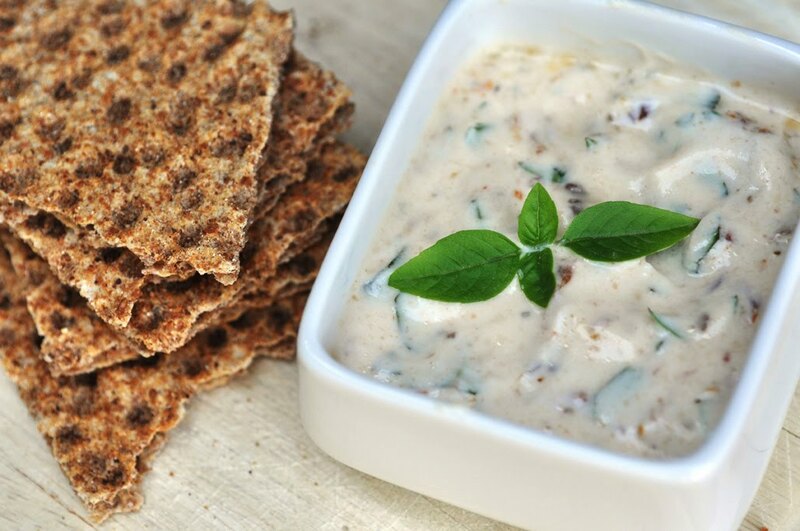 It is mixed together in no time and serves well as spread on crispbreads or dips for vegetables and crackers. The ideal thing for outdoor picnics, BBQs or a light snack. Drain and finely chop the sun-dried tomatoes. Wash the basil leaves and chop. Combine all ingredients in a bowl and mix well. Serve immediately or keep chilled.